In preparation for Topeka Science & Tech Fest on Saturday (Oct. 15 from 10 a.m. to 3 p.m. in Downtown Topeka, Kansas), I thought it would be fun to do a little science in the office. When I was in elementary school, Vicki Cobb, who wrote about science experiments for children, visited my school. I bought (or should I say my parents bought) a copy of her book, which I still have. I thought the inaugural Topeka Science & Tech Fest would be a great time to pull out the book and give an experiment a try. So I did. I began by following the directions, except using water balloons as opposed to a regular-sized balloon and garlic cloves in brine juice instead of dry garlic. After swabbing the inside of the balloon with a cotton swab dipped in garlic juice, the balloon really didn’t smell. After that I tried putting an entire clove of garlic in the balloon – and it still didn’t stink. So it was back to the drawing board. What did I do wrong? What could be done differently? 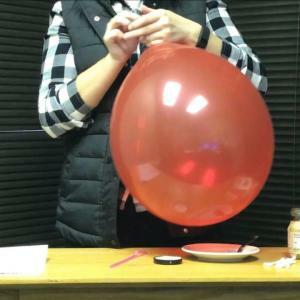 I thought this time I would try bigger balloons, as well as blowing the balloons up bigger to make the pores of the balloon larger (so the garlic air molecules would seep out more!). Also, instead of swabbing the garlic into the balloon, I used a straw to deposit the liquid into the balloon. This time around I created two garlic filled balloons, two with hunks of garlic and two with garlic juice. I blew the balloons up as much as I could without the balloon popping in my face. I then planted the four balloons in my boss’s office. To catch Michaela’s candid reaction, I left a GoPro on her desk while she was away. As you can see in the video, she smelled something a little funky when she came back. However, the smell was very faint. Just for kicks, I decided to prank Rosemary next. She was caught by surprise when her office was filled with balloons and didn’t notice the GoPro on her desk. Again, the smell was very faint. So after two different sizes of balloons and playing around with the way the garlic was inserted in the balloon, my conclusion is the garlic stink bomb is not 100 percent effective. But that’s one of the most important aspects of science, trying different methods and seeing what works and what doesn’t work. As for me, it’s time to put the garlic down and start using my math skills to dig into my social media analytics. By the way, are you following us? @VisitTopeka, where you are: Facebook, Instagram, Twitter, YouTube, Pinterest and Snapchat.